In addition to the original mission, NASA knew that there was a unique opportunity, if the instruments on the probes were still functioning after Jupiter and Saturn flybys. With proper launch timing and trajectory, the probes could not only study Jupiter and Saturn, but also Uranus and Neptune, without any increase in the amount of fuel needed. The configuration of the planets allowing this occurs once every 176 years. NASA decided to send only Voyager 2 on this path, while sending Voyager 1 on a faster path to Jupiter and Saturn. Between the two probes, they visited and collected data on 4 planets and 48 moons. Voyager 2 is still the only man-made object to fly-by all four of the gas giant planets. Following these solar system studies, NASA added the Voyager Interstellar Mission objective to both probes. The probes were sent on differing trajectories that would eventually carry both outside the solar system. On August 25, 2012, Voyager 1 passed beyond the heliosphere and entered interstellar space. The heliosphere is the outer edge of the Sun’s magnetic field and solar wind. It is far beyond the orbit of Pluto. Both probes carry the Golden Record. This is a phonograph record made of gold-plated copper for longevity; it contains a wide variety of information on Earth and humanity. A playback stylus is also included. 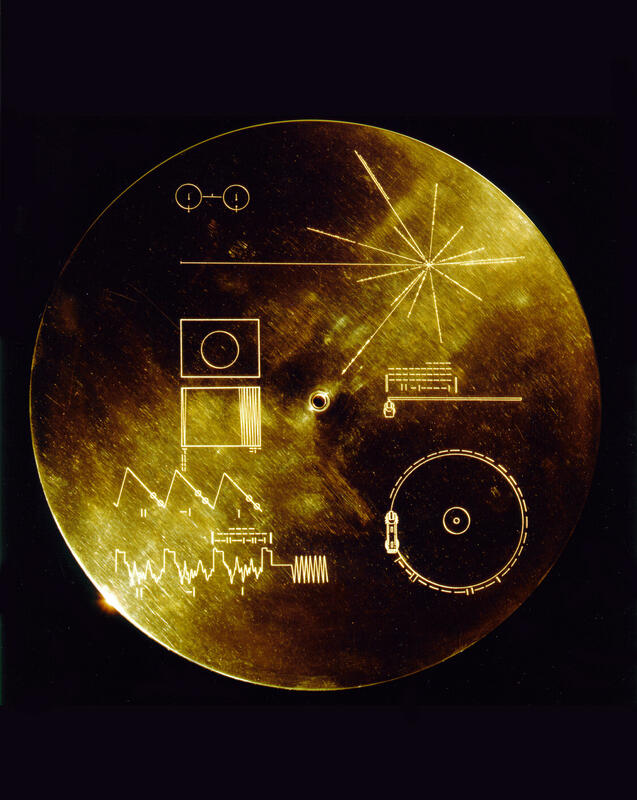 Along with the phonograph grooves, the record is engraved with symbols that are intended to help extraterrestrial civilizations determine how to play the record, as well as understand humanity. The Golden Record is expected to be useable for millions of years. NASA estimates that both probes will be able to send data back to Earth until at least 2020. After that, they will continue their trajectories carrying them further as Ambassadors to our Milky Way Galaxy. You’ve been listening to Western Slope Skies, produced by members of the Black Canyon Astronomical Society. This episode was written and recorded by Bryan Cashion.